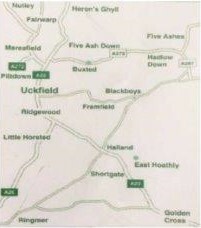 Our lists are currently open to new patients who live within or are visiting the practice area (see map opposite). Visitors will be temporarily registered. Individuals wishing to register must apply by completing form GMS1, available from reception at either medical centre or by downloading here. You will also need to provide proof of identiﬁcation. All patients registering with the practice are invited to have a health check with a member of the nursing team. Previous medical history and ongoing treatments are discussed and a brief check up is carried out.